An incident involving two Norfolk, Va., cops caught manhandling and pepper-spraying a Black teen is under investigation after bystanders recorded the confrontation which went viral. 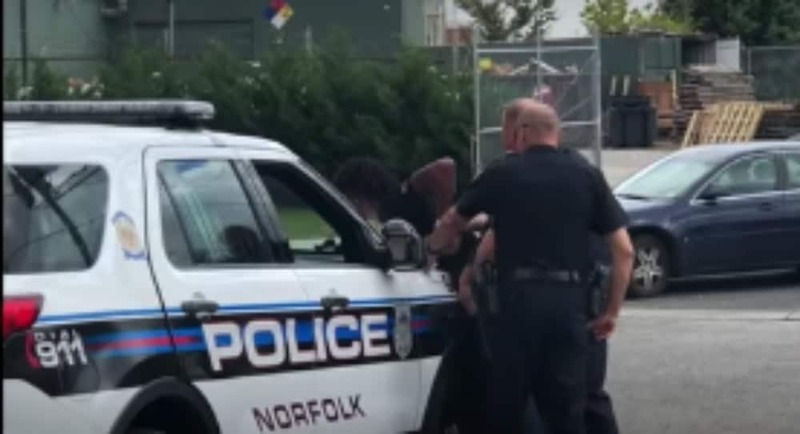 A 16-year-old boy was reportedly walking along a Norfolk street and was accosted by police who suspected he might be skipping school. While normally a truant child being caught out of class might result in a simple phone call home to a parent, in this case, the white officers were scene grabbing the boy and spraying his face with pepper spray. In the video, the boy is heard yelling you’re “pulling me to the ground. You’re pulling me down,” as the officer jostle the teen and search his pockets, the Washington Post reports. Two people passing by yell at the officers as they watch the incident unfold. The teen can be heard asking the police officers to uncuff him. “Relax, relax. You gotta relax, please,” one of the officers tells the boy. The police place the boy in the patrol car, but he then questions why and complains that he can’t see. “The officers stopped the 16-year-old under the suspicion of truancy, not being in school during school hours. During the interaction between the teen and the officers, one of the officers utilized OC Spray. The Office of Professional Standards is investigating the entire incident which includes the use of the OC Spray. “Paramedics treated the teenager at the scene and he was released to his parent. Charges for teen will be determined at the conclusion of the internal investigation. “The officers involved in the incident remain on duty and no officers were injured. The names of the officers have yet to be released. According to the Virginia-Pilot, the lawyer for the 16-year-old High School sophomore said Wednesday he doesn’t believe the Norfolk Police Department can impartially investigate the two officers involved in the viral incident. Don Scott called for the department to tap an outside agency to investigate or to bring in civilian oversight.